A statement in the World News today (12.07.2011) highlights the discovery by a research team at the University of Cambridge of an ancient lost world deep below the Atlantic Ocean, off the north coast of Scotland, UK. Is this the evidence that we have all been waiting for – or are we clutching at straws again? Please read comment 1 below – This new evidence has nothing to do with Atlantis except that it affirms the possibility that a large area of land can sink into, or rise from, the ocean bed, but for different reasons. An ancient landscape long ago submerged beneath the North Atlantic Ocean has been discovered by scientists. Researchers found the 56million-year-old lost terrain, which they have likened to the mythical lost city of Atlantis, by analysing data collected for oil companies using an advanced echo-sounding technique. The 1.2mile-deep landscape is located in the North Atlantic west of the Orkney-Shetland Islands and has peaks that once belonged to mountains and eight major rivers. 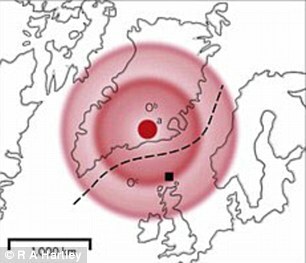 It would once have risen up to 0.6miles above sea level and probably joined up with what is now Scotland, and may even have stretched as far as Norway, the scientists said. Researcher Nicky White, from University of Cambridge, said: ‘It looks for all the world like a map of a bit of a country onshore. The discovery came from data gathered by a seismic contracting company. A hi-tech echo-sounding technique was deployed that involved releasing high-pressured air underwater – this produced sound waves that travelled through sediment on the ocean floor. An echo would bounce back each time these waves happened upon a change in the terrain through which they were travelling. This echo was then picked up by a microphone being dangled deep underwater from a ship travelling on the ocean’s surface. 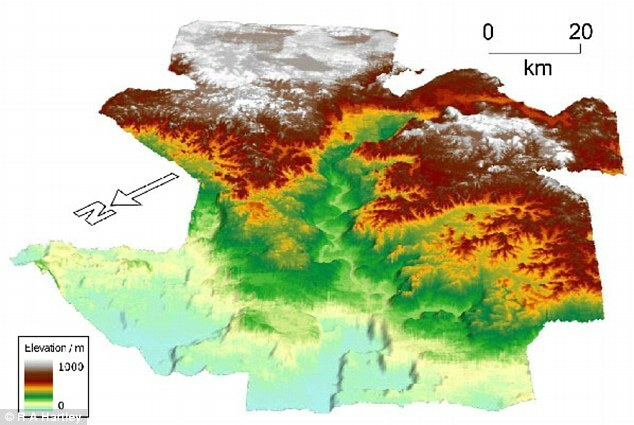 Scientists were then able to construct a 3D image of the terrain below, at which point they realised they had evidence of a submerged landscape. Evidence of land-dwelling life was gathered by core samples taken from the rock beneath the ocean – these revealed pollen and coal. Elsewhere, the Cambridge scientists found tiny fossils, proving the landscape was once a marine environment. They believe that the landscape rose up and subsided within 2.5million years due to the Icelandic Plume – an upwelling of material through Earth’s mantle beneath the North Atlantic Ocean. This functions by carrying hot magma from deep within Earth to just below the surface, where it ripples outwards. Dr White said the landscape was probably swept beneath the Atlantic during this magma surge. Indeed, he claims to have found two more recent underwater landscapes since, both caused by the same phenomenon. The team’s plume surge theory is most interesting. It may be that some such surge during the last Ice Age altered the level of the North Atlantic ledge, facilitating the transit of Upper Paleolithic Europeans to America ca. 18,000 years ago (the Solutrean hypothesis) — and probably even earlier as well. All this has nothing to do with Atlantis which was a supervolcanic island off Portugal that exploded and sank in the 17th century BC (see Roots of Cataclysm, Algora Publ. NY 2009).